The Rebel Sweetheart. 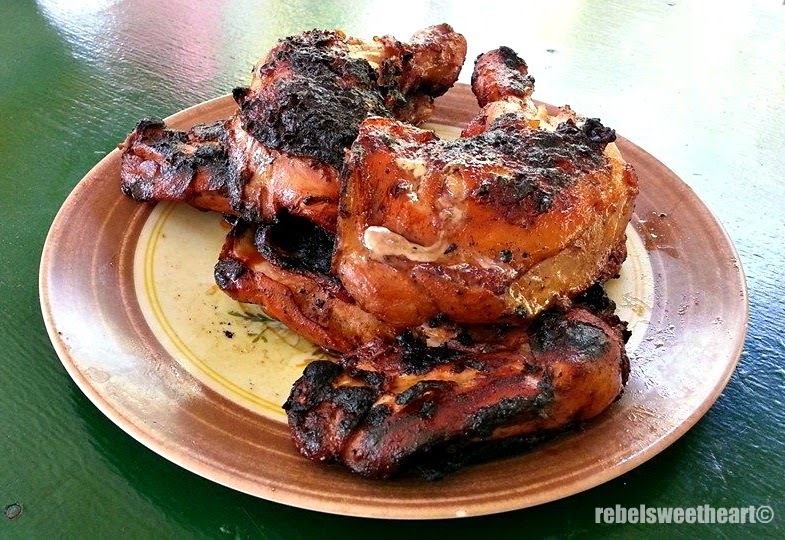 : Foodie Goodie | Chicken Barbecue. 1. For the marinade, combine the soy sauce, juice of 1 lemon, banana ketchup, salt, and ground black pepper in a bowl. Mix well. 2. Place the chicken leg quarters inside a large freezer bag, and then pour-in the marinade. 3. Shake the bag gently to coat the chicken with marinade. Remove the air inside the bag, seal it, and refrigerate overnight. 4. Remove the chicken from the bag and transfer the remaining marinade to a bowl. 5. Heat-up your grill and start grilling the chicken under medium heat for 12 to 15 minutes per side or until the chicken is completely cooked. Remember to baste the chicken using the remaining marinade mixture. Also, keep in mind that chicken takes a long time to cook. Grilling it in high heat will cause the outer part of the chicken to become charred, with the inside still raw. 6. Remove from the grill and transfer to a serving plate. 7. Serve with steamed or fried rice. Chicken BBq is one of my favorite and also a picnic or an outing won't be complete without this. I hope you had great time for your early summer outing and that you were full for that mouthwatering Chicken BBq. This looks really delicious! Thanks for sharing the recipe! That looks really good. I love barbecue chicken. i have to try this one. It seems easy to prepare and the ingredients are all readily available! Will try it at home thanks for posting! Sa family ko sis, iwas iwas muna kami sa anything grilled. Or if gusto talaga I limit them ng once a month lang. Medyo natakot ako sa consequences sa health ng grilled foods eh. hahahah! i like the devouring part. will try this kasi my mom loves to hang out sa beach and sa chicken. My kids' favorite! You can fed them this everyday and they won't stop eating. yummmm! barbeque chicken while at the beach is perfect! thanks for sharing the recipe over at Food Friday, sis!